If you’re a keen yogi or a regular pilates-practicer, you may be missing it while on your hols at the cottage. I recently scoured the internet for information on classes but could not find much, turns out a good old fashioned cafe notice board is the best way to find out what’s going on. I found these adverts on the board in Shepherd’s in Hay on 21/07/15. I made contact with Emma and was made to feel very welcome at her Friday morning pilates class in Hay Parish Hall (the hall could do with a lick of paint, but does have a gorgeous parquet floor and a certain charm!). Emma also does classes at Booth’s Books, and she tells me the rooms there are beautiful. Find Emma’s contact details here, and Booth’s information here. Bookworms go to The Kilvert Society. The church is usually open and welcomes visitors. A gem of a garden with woodland walk, close to Hay – viewing by appointment only, April to mid-September. Cusop HR3 5RQ 01494 820 773. 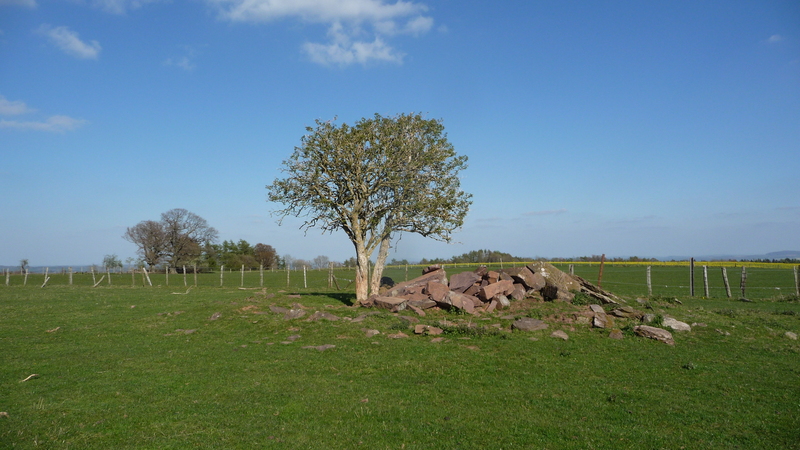 On Good Friday, in glorious sunshine, we managed to walk to the lone tree which is visible from our kitchen window. There is a footpath most of the way there, but not the last bit, so we had to take an unclassified track and inevitably came across a farmer on a massive tractor that could travel at 45 mph (or very close) with a 10 foot harrow on the back and wheels the size of hay stacks. “What you doing here?” he inquired after turning off the roar of the ten thousand hp engine that powered his machine. “Just out for a stroll” I replied “Following the footpath sign at the bottom of the hill”. There had indeed been a FP sign pointing straight up the track we were on but, having both a 2.5 inch per mile OS map and my hand held GPS hidden in my bag, I knew exactly where we were and that the FP sign was incorrectly placed. “Whare you going then?” he ventured, not to be helpful, but to get us to change direction. “Over the hill into the Wye Valley…” I explained. “Then you need to turn around and go up that path, which will take you to the footpath”. “Oh, thank you so much” I said and off he and the harrow trundled away. We did indeed follow his instructions, back down the track a little way, and up the other track but, once out of sight, we ducked down and edged along the line of trees to the top of the hill, where my GPS indicated a 90 degree turn would take us to the Lone Tree field. There was a good path alongside the woods to our right and some ploughed fields to our left. Suddenly I saw an enormous rabbit but, of course, it wasn’t a rabbit, it was a hare; it was standing on its back legs about 50 yards away looking ready for a boxing match. He turned his head, saw us, and took off. We were now close to our objective field and, as we approached, we realised that we were on one of those top-of-the-world points where you could look right around 360 degrees and see a great distance in all directions. To the south across two valleys, the sharp contour of Hay Bluff stuck out and you could follow the horizon all the way to the Black Hill and Cat’s Back with, even further away, the cliffs of Red Darren along the top of which runs Offa’s Dyke. To the south we could see up and down the Wye Valley with the Welsh hills disappearing in the far distance all the way to the Elan Valley; downstream was Hereford and the Malvern Hills some 10 miles beyond. One more gate to go through and we were alongside our sacred tree. More scrubby than it looks from the kitchen window with an untidy pile of rocks underneath but, nevertheless, it was The Tree and, standing in front of it, we could pretend to be able to see our kitchen window. 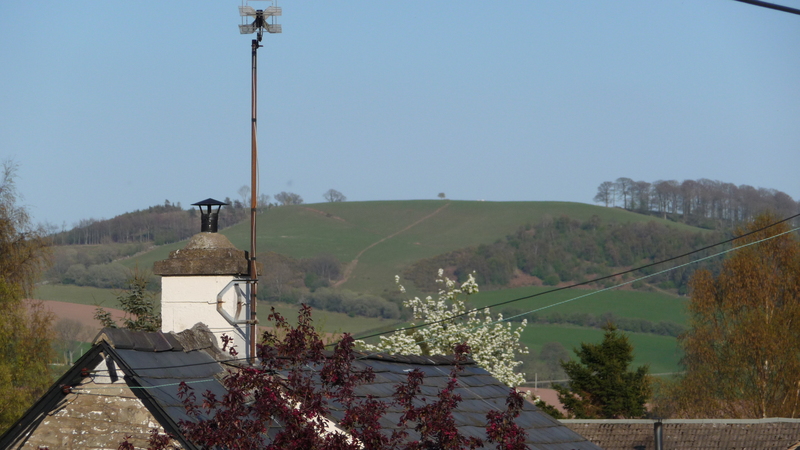 In fact it was not easy to see more than the smudge of housing that is Dorstone village; even the church tower was none to clear! No need to linger, photos taken (as attached), we set off westward and downward along side the woodland fence which, I noticed had grown from an ordinary 4 or 5 feet high to some 10 feet high of close mesh. Was this to prevent Billy the Boxer Hare from leaping over? Certainly not one for us to jump until I realised that, unless climbed over it, we would have to walk a long way down the valley ahead and then up again to reach the path we needed. There was no barbed wire involved, we had little difficulty deciding that it was a far better thing to climb its dizzy height and over, rather than dropping some 300 feet on foot and up a similar amount to get home. Once over, we were in a battle zone – a former forest now chopped down and logged by giant cranes and bulldozers with deeply rutted tracks to negotiate before we reached the solid path shown on my map. 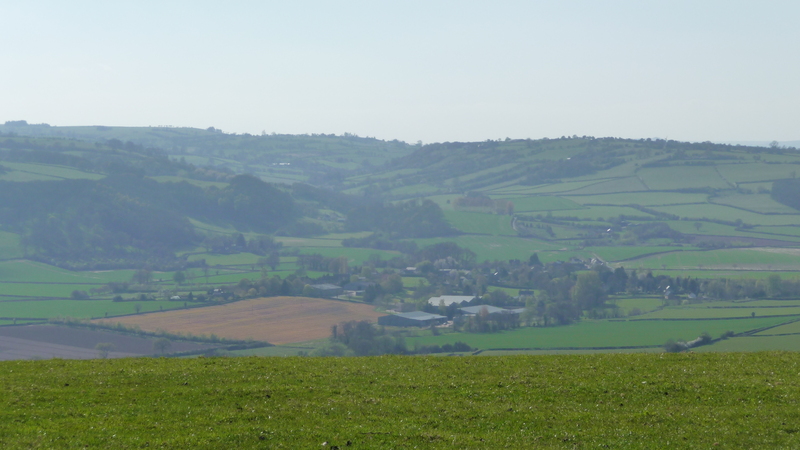 We walked on and soon escaped the desolation into the open farmland of Dorstone Hill – near to where there is an archaeological dig seeking early Herefordshire man. The road then appeared and took us down the 25% slope to Dorstone past some deer in the woods. I managed a very welcome pint of Butty Bach in the Pandy Inn with Magdalena before reaching the cottage.